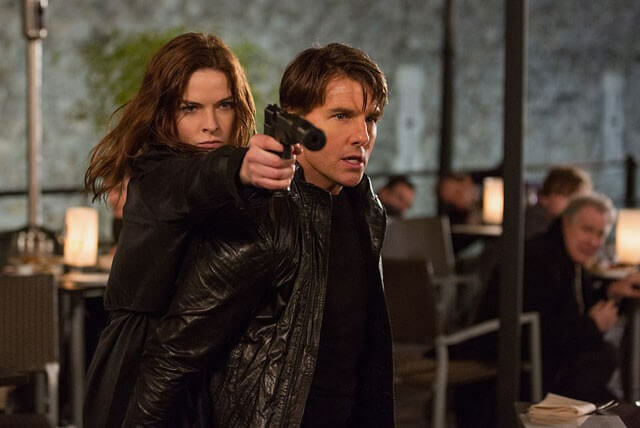 Everything you expect in a Tom Cruise film is on display in the latest installment of the Mission Impossible franchise: Rogue Nation (a subtitle which has nothing to do with Anna Paquin or the X-Men). Tom runs. Tom drives a motorcycle. Tom punches some bad guys. Tom flirts with the female lead. Tom bangs his fist on inanimate objects when enraged. Tom out-thinks both the villain and the good guys who think his methods are too dangerous (you’re still right Iceman, he is dangerous … and again, that has nothing to do with the X-Men). Before I figure out some other way to meld Mission Impossible with the travesty that is the X-Men cinematic universe, let’s just get back to Rogue Nation. Here, Tom and friends are on the heels of a shadowy organization known as the Syndicate. Thanks to our heroes once again being disavowed, they have to go it alone, trying their best to gather proof of the Syndicate’s existence so the CIA and MI-6 can help out all while dodging the CIA and the Syndicate’s efforts to increase the body count. As usual, the plot really isn’t all that important and the whole point is to try to figure out how to put someone in a fancy Mission Impossible mask so they can trick people into giving up intelligence. What was nice to see was an increase in screen time for Simon Pegg’s character. His introduction to the series in the third film helped to provide someone in the team audiences could relate with and added comic relief without making it look like bad James Bond one-liners. Ving Rhames returns to the fray, as does Jeremy Renner. And the main Baldwin himself (Alec, of course) is introduced as the director of the CIA who’s doing all he can to capture/kill the franchise’s central character … so you know how well he’ll do at it. New to the series is Rebecca Ferguson, whose true loyalties are supposed to be unknown so I’ll refrain from saying more although I don’t think you’ll have a hard time coming to your own conclusion. She’s a nice mix of beauty and brawn, complimenting the fight scenes and providing the most interesting look at the psychological toll the spy profession takes out on its participants. Trying to keep my snark in check (for now), the positives outweigh any cynicism I may throw out shortly. The action is good, though sadly almost every one of the action scenes was spoiled in the trailers. And while Renner was basically wasted here (I don’t even remember him getting to throw one punch as he spends most of his time attached to Baldwin’s hip providing misdirection), the camaraderie between the actors is what keeps the film from being a faceless spy flick. The bottom line here is that this is fun, diverting, and what you’d expect and want from a summer popcorn flick. Unleashing my snark, while I’d happily welcome more films in this series, as they seem to have finally figured out the formula after fits and starts among the first three films, I’m hoping they figure out a way not to continually rehash the same plot points every other film. The first film saw Cruise on the run from the IMF who thought he was a rogue agent. The third film saw Cruise on the run from the IMF who thought he was a rogue agent. The fourth film required that Cruise and his team go rogue to accomplish their mission. This latest film sees Cruise on the run from the CIA who thinks he’s a rogue agent. Sure, they changed the agency acronym this time around but I think you see the point. The second film, no matter how strange and generally awful it is, at least came up with a different plot device. Also, and this is slightly off topic, although I wholeheartedly endorse people seeing this movie, please do not do so in IMAX … unless you actually have an IMAX theater … and even then there are reservations to that notion. First, let me say that in San Diego where I live and watch movies for the most part, there are zero IMAX theaters showing entertainment films (there’s one showing educational films only). Before anyone in San Diego says, “but almost every theater here shows IMAX movies in a theater purporting to be set up for IMAX”, I’d like you to take a trip to another city with a real IMAX theater and then see the difference. A slightly larger and curved screen does not mean you’re getting the IMAX experience. Add to that the issue of films advertising themselves for IMAX presentations not really providing the full experience. Director Christopher Nolan has thus far been front and center in pretty much giving audiences more than the rest but that means there were a total of 6 scenes in The Dark Knight (3 of which I even remember). And while there were more elements shot with 70mm film (IMAX format, regular is 35mm) in Interstellar, it really won’t be until we see the Avengers: Infinity War two-pack of films that we’ll see a Hollywood blockbuster actually shot fully in IMAX. There are digital conversions but that’s cheating, not the same, and I’m trying not to fully shoot off into a tangential universe any more than I already have. Look, before I burst another blood vessel, my point here is that there are two gimmicks Hollywood is duping audiences with right now: 3D and IMAX. At least with 3D, even with the crappy conversions, there were people paid to do actual work (regardless of the results of their efforts). IMAX is more infuriating because you’re paying to watch a letterbox version of a film because the format doesn’t fit the IMAX screen (if you even have a theater that truly gives the scale and grandeur of the format … which again, San Diego does not yet … a few are on the way but won’t open for at least a year). There are some instances where this still adds to the experience but only when the 35mm film in question utilizes amazing cinematography and grand spectacles (I would think Mad Max: Fury Road would fit this bill). But don’t be fooled into thinking you’re seeing some special version … you’re seeing the same film everyone else did but on a larger screen, and short the extra cash for some Junior Mints. So if you can remember a time when this ranting was about Mission: Impossible – Rogue Nation, then you know it’s worth seeing if you’re a fan of the franchise. Just make sure not to pay the extra few dollars for a screen that won’t give you any more bang for the buck (and of course, you can skip the 3D which I thankfully wasn’t subjected to at the screening I attended).